In Hansol Jung’s Cardboard Piano, produced by Timeline Theatre and directed by Mechelle Moe, we find ourselves trapped in a church without a redeemer. Two teen girls, one the daughter of an American missionary, the other a Ugandan, exchange vows by cande light on the eve of the millennium. Chris (Kearstyn Keller) is the typical preacher’s kid, stubborn and questioning of her identity in relation to her father’s, a bit naïve with the heart of a runaway. Adiel (Adia Alli) a young Ugandan girl is a persuasive quick thinker, harboring compassion and calm, all necessary traits for a young girl surviving in a war-torn country. Together, their chemistry and love are infectious, but this proves dangerous in a country collapsed by colonialism, mind and body. In Uganda, homosexuality is not only a sin, but illegal. This production steeped in history, themes of compassion, acceptance, and reconciliation hits just as hard in a world—a city—simultaneously engaged in acts of war and recovery. We are the congregation in this drama. Above us are wooden beams, outlining a skeleton of the roof (scenic design Jeffrey D. Kmiec). The back wall of the altar is patterned with intricate carvings allowing ample play with light and shadow (lights Brandon Wardell). The alley stage gives way to a beautiful opening scene centered with wooden pews and bowls of rose petals. As the four-person ensemble enters the church, we are met with their singing, a sound so haunting and mesmerizing it’s not to be forgotten. Powerfully underscoring the journeys of these characters is David Kelepha Samba’s incredible sound design. The rain storms and lightning have personality, and, to Chris, they voice the opinions of God. Beneath the façade of young girls in love, there is much uncovered and complicated by Chris’ desire to run away with Adiel. It would be easy to fall into tropes of white saviorship, but our playwright Jung delicately balances on this fine line. When Chris declares Adiel’s ability to make “pretty things” can get her into an American university, Adiel is quick to shut her down. To leave her home and her family comes at a greater cost than Chris originally realizes. Though these moments are tense, Moe directs with an eye on tenderness and joy, even in the most strained of conditions. Though we may lose ourselves in the love and friendship of our femme leads, we are soon reminded of the brutality of living in a colonial war zone. With the entrance of Pika, a runaway teen soldier, heartbreakingly played by Freedom Martin, our teens are faced with difficult moral decisions. We are reminded that categorizing people as “good” or “bad” is fraught, especially when deprived the agency of choice less they befall personal harm. Cardboard Piano is a gut-wrenching exploration of what it means to love, to forgive, and to heal. 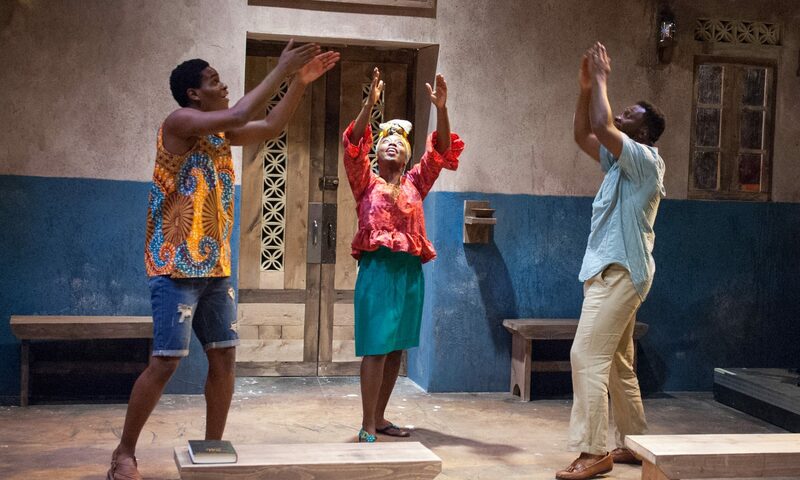 With a story set in a foreign country, one usually known for its poverty and third-world status, this production comes at a necessary time when our own country must reckon with its rejection of its roots and culpability for the world’s trauma.